The Buick Verano debuted in North America in 2012 as the first compact marketed by Buick since the 1997 Buick Skylark and has enjoyed good sales numbers to date. 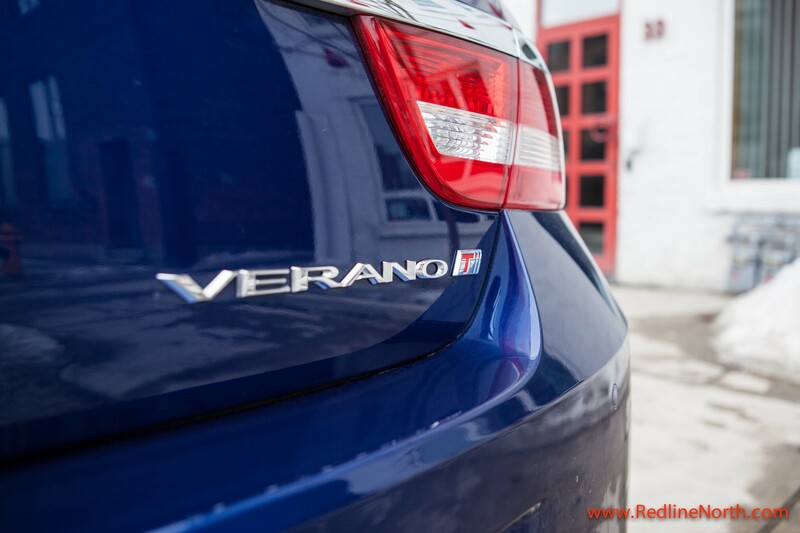 RedlineNorth had a chance to review the 2012 model and what stood out most to us then was its overall sportiness for a four door sedan and its superior level of fit and finish. The 2013 Verano includes the release of a new turbocharged engine, borrowed from the Regal GS and offering increased power, as well as stiffer suspension and subtle exterior styling changes. With Canadian sales of Buick passenger cars up 23 per cent in 2012, the new turbocharged Verano adds another dimension for Buick to continue its stellar pace. For the 2013 model year Buick offers two engines for the Verano; the standard 2.4L ECOTEC I-4 providing 180 hp and 171 lbs of torque and an optional 2.0L ECOTEC I-4 Turbo engine taken from the Regal GS. The turbocharged engine produces a whopping 250 hp and 260 lbs of torque and will do 0-60 mph in 6.2 seconds. Despite this additional power there is very little reduction in fuel efficiency, thanks to GM’s innovative turbocharger technology. The 2.4L standard engine offers a combined fuel rating of 9.9L per 100 km which increases to only 10.1L with the turbocharged engine. It should be noted that premium fuel is recommended for the turbo engine. Happily, the turbo version of the Verano is offered with both automatic transmission and a 6-speed manual. With the dramatic decline of manual transmissions offered these days in the North American market it’s nice to see General Motors still provides the manual offering. During our test period we especially enjoyed the stiffer suspension the turbo model provides as it hugged the road in the corners and provided excellent stability when accelerating. The steering felt accurate, however, there was a bit of softness overall, the kind you would expect in a four door sedan as after all it’s not a sports car. There are very few visual clues to distinguish the turbo model and these are limited to the dual exhaust, a small ‘T’ beside the model name and a rear deck spoiler. 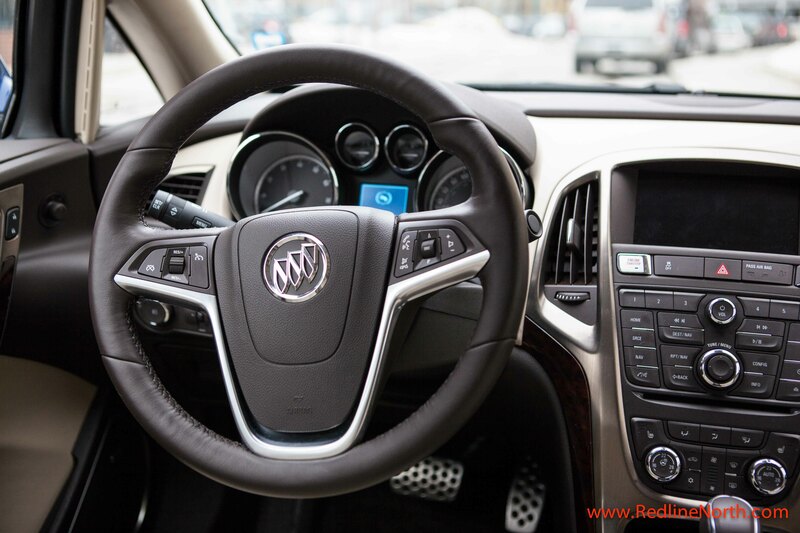 While the Verano shares a number of Buick styling cues from the waterfall grille, portholes and chrome accents, it does have a much sportier and more aggressive persona than your father’s Buick, but it’s still hard to shake that stately sedan look. 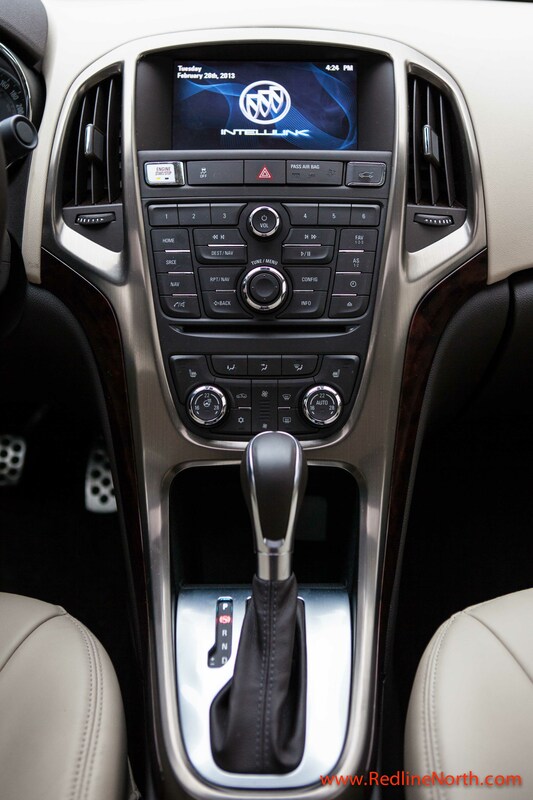 The interior of the Verano has a wealth of luxury features from beige leather seats, dual zone climate control, and a heated steering wheel to a more understated, but desirable feature which Buick calls QuietTuning. QuietTuning provides additional acoustic insulation, sound deadners, and triple-sealed doors all intended to provide a quieter ride. When driving at highway speeds the Verano did provide a noticeably quieter environment, which adds to an increased sense of luxury in the vehicle. 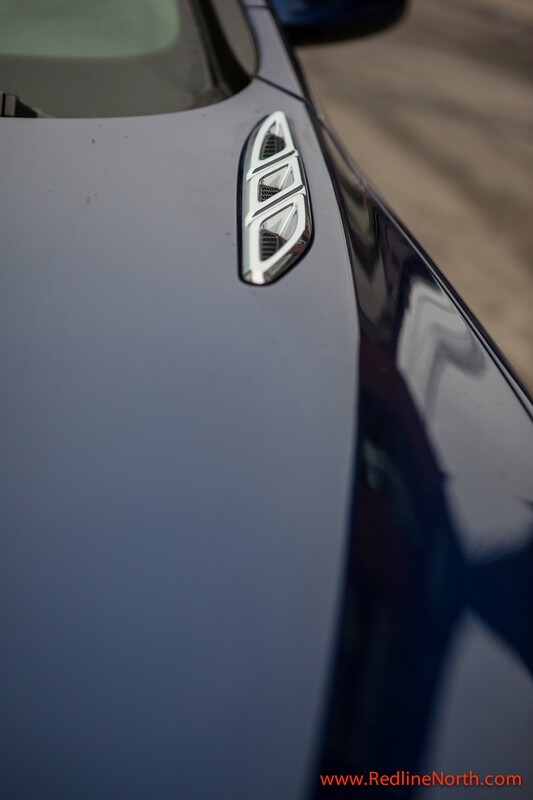 While the interior won’t be mistaken for a Bentley, the car does offer some excellent features and an attention to detail to help make those daily drives that much more comfortable. Storage in the Verano is more than adequate with 396 L of cargo room. The trunk space is very roomy, especially for this class of vehicle. However, it would have been nice to give up a bit of the space in the trunk for more in-cabin room. Depending on your stature, the Verano could feel a bit cramped around the driver’s seating area. Overall cabin ergonomics are good with an easy reach of stereo, climate control and navigation controls, although things still felt a bit too close at times. In addition, rear leg room felt quite limited and may be challenging on long journeys, especially with adult passengers. All Verano models except for the base model now come with a Side Blind Zone Alert feature. When overtaking, or being overtaken, a visual indicator appears in the side mirror alerting the driver to the presence of another vehicle. The Blind Zone Alert was used extensively throughout our test period with the Verano, so much so the reviewer was looking for the warning indicator light in their own vehicle afterwards. This feature should not be under rated and is a welcomed addition to the 2013 model. Other additional safety features included in the Verano are ten standard air bags, a collapsible pedal system, which allows the pedals to detach during a crash to reduce the risk of leg or ankle injuries and the inclusion of the StabiliTrak electronic stability control system to help reduce the risk of rollovers. The refinements made to the 2013 Verano Turbo, including the advanced safety features and the addition of the 2.0L turbo charged engine are a welcome addition to an already well equipment compact sedan. As a result of the new engine, suspension and steering have been tweaked to support the extra ponies under the hood and Buick has done a good job here. The interior offers a number of luxury features, including Quitetuning providing a noticeably quieter ride as well as a leather wrapped heated steering wheel, a nice touch for those cold Canadian winters. There is plentiful trunk cargo space in the Verano, however, interior cabin space is a bit lacking with regards to rear leg room. 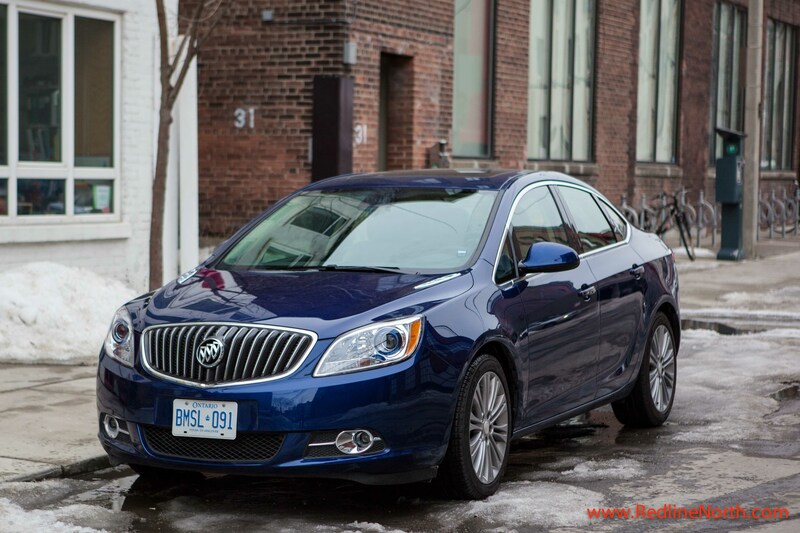 Overall, Buick has done a great job with the Verano Turbo and it is a very worthy competitor in its class. Buyers in this market segment should seriously consider adding the turbocharged edition of the Verano to their short list. 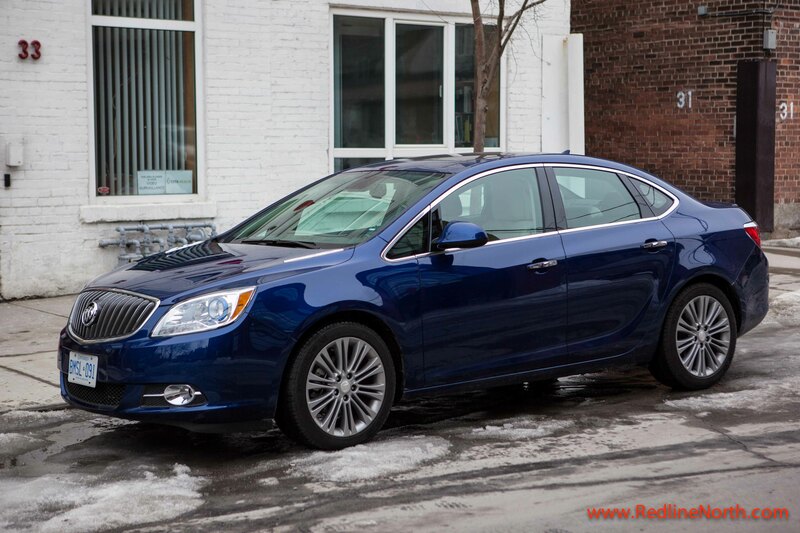 This entry was posted in Review and tagged 2013 Verano, 2013 Verano Turbo, Buick Verano, Verano Turbo by northredline. Bookmark the permalink.